$5 off the International Teacher Identity Card (ITIC) for SSTUWA members. Who says students should get all the goodies – teachers deserve discounts, too! The ITIC is the only internationally recognised proof of your full time teacher status. What’s more it’ll save you a whole heap of cash along the way! The ITIC card pays for itself, giving you access to thousands of discounts around the world on airfares, sightseeing, food, museums and more! With the ITIC you have instant access to some amazing benefits both in Australia and globally! Flights –save up to 40%! The only globally recognised teacher identity endorsed by UNESCO. Teachers travel on student fares – save up to 40% on international flights with STA Travel! Access to over 42,000 discounts worldwide. Access over 5,000 discounts in Australia and New Zealand. The ITIC was created to make it easier and less expensive for teaching professionals to travel. By providing official proof of your status in the teaching profession, ITIC opens the door to thousands of services, benefits and discounts around the globe. The card is recognised by universities, academic institutions, student unions, national governments, financial institutions and ministries of education around the world. With the ITIC card, all these deals and more will be yours for the taking! Get up to 20% off thousands of restaurants, bars & cafes in Australia & NZ. Discounts with STA Travel on flights, accommodation, insurance and more! Save 5% off groceries, fuel, liquor & more with Woolworths WISH gift cards. Save 5% off iTunes eGiftcards & David Jones eGiftcards. More than 42,000 discounts in 130+ countries. Up to 40% off international airfares at STA Travel. 5% off STA Travel Insurance. Free ISIConnect travel sim card. Discounts at top attractions globally. Discounts are subject to change without notice, please visit isic.com.au for more information. Student teachers who are members of the SSTUWA can purchase ISIC (International Student Identity Cards) with this same great discount! ISIC cards are great for those doing study abroad and exchange programs. Download the free ITIC app to easily search for ITIC benefits and discounts worldwide straight from your phone. In order to be eligible for an ITIC card, you must be a teacher, professor or instructor engaged in full-time employment at an accredited educational establishment for a minimum of 18 hours per week and for a minimum of one academic year. Cards have 12 month validity from date of purchase. The card is not refundable and not transferable. You will be asked to provide an Australian postal address for delivery of your card. Please note we are not able to post cards overseas. 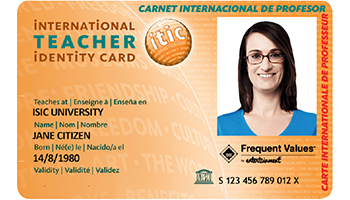 By purchasing this card, you will become an ITIC/ISIC member and agree to membership terms and conditions, including the privacy and communication policy to be found at isiccard.com.au and you will be informed with the latest offers and discounts from ISIC (you may opt out at any time). All offers and discounts are subject to change without notice. Identification document, eg passport, birth certificate, an official identity card issued by an official authority. Proof of full time teacher status. To prove your full time teaching status, you will need a letter on official school or university stationery. This must state that you are employed at a recognised school, college or university for at least 18 hours per week, for a minimum of one academic year.